A few odds and ends of press I got over the past few week that I should mention. First is a really great write-up in the The Onion (Milwaukee edition) written by Rebecca Cook. The cool thing about that was Nathan's band had a huge write-up a few pages over, I love it when we get press at the same time. Ken Taylor wrote an article on indie craft with quotes from both Cortney and I in XLR8R Magazine. It's on the last page in the September 2008 issue if you want to check it out, but I've scanned both in HERE & HERE too. I also did a radio interview with Paul Riismandel on media geek which you can stream HERE. The stitches are so perfectly wonky. Best eves. About a week and a half ago I received a surprising email from Penelope Green, a writer from the NY Times who was interested in writing a story on me. She wanted to know what the inside of my house was like for a possible story in the Home section. There would be connections made with Handmade Nation to my home interior/art collection. I sent her some images (which I had posted without explanation on flickr) of our place and the story was approved! Within a few days she was scheduling a trip to Milwaukee. Mind you, I had just finished shooting the credits to the documentary and was prepping for a music video shoot that very weekend so my life (and house) was in total chaos! The idea that a reporter was coming to write about our home, a reporter from the NY Times, was a little insane for me to wrap my brain around. I spent that single day cleaning, and could of used 3. Nathan, my super dude helped me not loose my mind (per usual) and helped out a ton. On Tuesday August 19th Penelope flew in from NY to Milwaukee and we had a 4 hour interview in my house/studio/gallery (all the same building). I was told to expect a call to set up a time for the photographer to come by that week. I got a call later that day from Darren Hauck who is a local photographer who cover Wisconsin for the NY Times. He came by on Thursday to take photos, which was almost more nerve wracking then the interview itself. So sometime in September the story will run, I'll let you know as soon as I find out the date. Craft In America nominated for an Emmy Awards! Craft In American director Carol Sauvion passed along this news to me via email. She had been in NY for the Peabody Awards and Sabrina Gschwandtner took the time to show her the 20 minute work in progress clip of the documentary I had screened at Light Industry earlier this Summer. Massive congratulations go out to Carol and her crew for their massive accomplishments with their project. The Craft In American website has information on local TV programing and information on how to purchase the DVD. 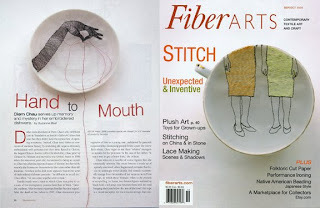 Diem Chau who I have worked with at my gallery and was also a part of the Devotion To Thread show is featured on the cover of Fiberarts Magazine this month, the article was written by Susan Beal (who is a contributing essayist for Handmade Nation the book). I was the set designer for this shoot at the Pabst Theater on Sunday. It was a music video for Decibully directed by Sam Macon. I blogged about it HERE. After the screening at the Hull House I stayed in Chicago for 3 more days. This has been schedule for months. My good friend Sam Macon who is a director at Radar Studio in Chicago and I have been planning on working on this for quite some time. Since we are both busy bee's scheduling shooting the opening sequence credits took a bit, but we did it. Our idea was to always do something by hand, we talked about a lot of ideas and stop animation was always on the front burner. Early in the week it was decided that stop animation was the way to go. I spent Friday prepping with creative Annie Simeone who was in town from New York to assist. I had loaded up my entire studio of supplies for the weekend into my rental on Thursday and we had a few random supplies we needed to get here and there. Thankfully she used to live in Chicago and totally knew her way around, and drove everywhere for me (we were both happy about that). Stop animation + mushbrains = the raddest thing ever. This past Thursday I had a screening of the 20 minute work in progress at the Jane Addams Hull House Museum in Chicago. I drove down with Cortney Heimerl (co-author of the book) to the event. We didn't have a chance to see the museum itself, but the actual screening room was super cozy. I then stepped up to do a quick introduction about Handmade Nation. Side note: I have had this cough that plagued me throughout the night (it was the worst during the panel discussion!) I wanted to punch it out of my lungs..... unfortunately, that isn't how one gets rid of a lingering cough. Then there was a panel discussion with Deborah Maris Lader & Lindsay Obermeyer, Shannon Stratton and myself. It was a great event, I was super happy with the turn out and feedback I got. There was even a writer from Time Out Chicago who did a review of the event HERE. Stay tuned for Part 2 of Chicago which is super exciting.... we shot the opening credits for the documentary this weekend!!!!!!!! ahhhhhh. This weekend Kim (co-owner of Paper Boat), Nathan (ye ol' boyfriend) and I all made the trek to Sheboygan to see the Civil Liberties show at the John Michael Kohler Arts Center. The Handmade Nation 8 minute trailer is on a continual loop in the gallery with the audio playing out loud (for 2 months!). It was so exciting to walk into the room and hear the familar voices of crafters I know! You may or may not know that my band, Wooden Robot, is the soundtrack music to Handmade Nation. We have been a band for over 6 years with a solid core of members (there are usually around 6 of us who play live, this show there were 7). That's me in the back in the green dress, I play the musical saw. This photos is us playing at my shop, Paper Boat Boutique & Gallery, in Milwaukee at the art opening for Leif Goldberg and Erin Rosenthal on Friday, August 1 2008. If you are interested in Wooden Robot you can check out our myspace page, it's pretty random but you can hear more of our music. We will be releasing the actual album that is the soundtrack to the documentary this Fall/Winter and it will be available for sale whenever I screen the film (and I'm there) as well as online.